These days I should have been working on polishing SuiteFramework API which I promised to release on june ( this will teach me to announce release dates… ) but my procrastinating mind always finds a good reason to believe there are other things that deserve all my attention, RIGHT NOW. One problem that raised while trying to run the injected code is that both Firefox and Chrome expects an addon to explicitely declare which API packages it will run. Thoses permissions are declared in manifest.json for Chrome. On Firefox both the online add-on builder and the command line SDK ( which I recommend for working locally ; check “Get the SDK” at the bottom of this page ) create a harness-options.json manifest file automatically during xpi build time (the whole process is explained here). On Chrome you have to declare what you use manually in manifest.json. So if we want developers to be able to inject any method available by the APIs then it is necessary to give permission to all of them inside KBX. A Kynetx browser app that adds github search (inspired by “Github address bar search” ) in the Location Bar (Firefox) or Omnibox ( Chrome) . As all Kynetx browser apps this app is cross-browser. 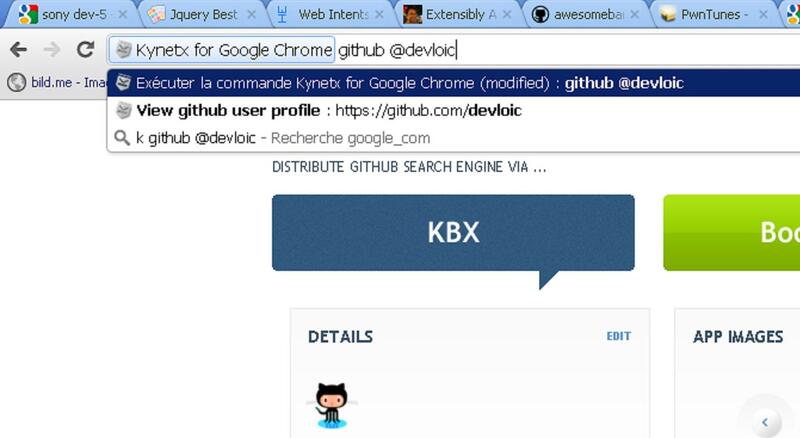 On Chrome the github search engine gets invoked by first pressing the ‘k’ letter when the cursor is in the omnibox. Then you can type : github mysearch_terms to search for “mysearch_terms” on github or type github @someuser to get “someuser” profile page. On Firefox you don’t need to press ‘k’ first . Get the modified KBX for Chrome and KBX for Firefox . Install Kynetx “Github Search Engine” app . For now this modified KBX extension is experimental. If the concept reaches maturity then we can expect richer Kynetx browser apps that go beyond the scope of webpages because they can interact with location bar/search bar, take screenshots , make desktop notifications, modify context menus, make cross-Origin XMLHttpRequest … and do all the things browser addons/extensions you find on Mozilla Addons and Chrome Web Store do. remote_url_eval_in_addon([“http://lolo.asia/kynetx_remote_eval/omnibox_lib.js”,”http://lolo.asia/kynetx_remote_eval/github_search.js”]) and the KBX extension will add the missing _chrome or _firefox part . Another method you can use is webhook_eval_in_addon(webhook_array) that can be used inside an emit << js_code >> . It takes an array of objects as unique paramenter. Each object has the field ‘appid’ which targets a ruleset and ‘eventname’ which targets a webhook in that ruleset. The omnibox_lib webhook returns a browser specific library of plumbery code for adding search engines to the Location Bar/Omnibox with the add_search(options) function. You can create your own custom and more elaborated search engine with dynamic suggestions by writing a new webhook that returns js code that calls add_search(custom_options) . – specify a cross-browser API that aims to provide access to installed extensions/addons as if they were services using things like code modules on Firefox or cross-extension messaging on Chrome . KRL rulesets could then mashup data/features provided by installed extensions/addons .